My plans backfired yesterday - Vance did not take a nap. However, I did try to post but Blogger was down, so everything was working against me. Here's what I have done. On the list of instructions I'm not even half way done. I guess I didn't realize that each little piece could require up to 4 steps. 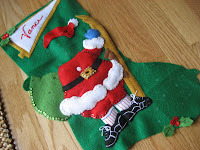 Embroider! Sequin! Applique! Stuff! Repeat! 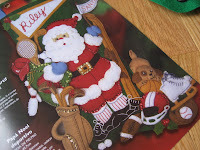 Sporty Santa might be missing a few pieces of his sports equipment, might not look so damn jolly, and his puffy little blue hand might accidentally appear to be flipping the bird. But by Christmas he'll be hanging from the mantle. And Vance will love it.